Food Hussy Recipe: Cheesy Sausage One Pot Pasta! | The Food Hussy! 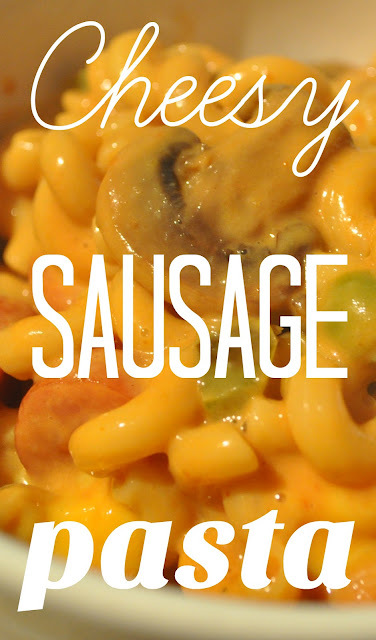 Food Hussy Recipe: Cheesy Sausage One Pot Pasta! I love smoked sausage (aka kielbasa, mettwurst, polish sausage) - my absolute favorite is Queen City's Cheddar Metts. And there is nothing more comforting than a cheesy pasta dinner - so I put it all together in my Cheesy Sausage One Pot Pasta! First, I cooked up some cavatappi and then drained and set it aside. Then I sauteed smoked sausage, green pepper, onion and mushroom in the same pot. I just wing it as far as the amount - it really depends on what you like and what you have on hand - probably 1/2 onion, 1 pepper, 1 package mushrooms (I love mushrooms). Then I added a small can of tomato sauce - I was going to add tomatoes but didn't have any in the cupboard - so tomato sauce would have to do. Then VELVEETA! How can you go wrong with America's favorite processed food product?! I love this stuff and had some left in the box so I diced it up and threw it in the pot. Because it was a little thick - I did add some cream to it - you could easily use milk as well - just to thin the sauce a little. Then toss in the cooked cavatappi and you're good to go! Serious comfort food here. Stir it all together and you've got dinner plus leftovers for lunch! Seriously - how can you resist this bowl of cheesy sausage goodness? It's the perfect food for a cold winter's night and it's such a quick easy meal - you can't beat it! I love one pot recipes and this does not disappoint!